my heart is saying, 'don't let go. i'm hopelessly devoted to you." we often talk about a crisis in vocations. what exactly are we talking about? what is a vocation? how does one discern this? vocation is many things, including marriage between a man and a woman, conscecrated celibacy + virginity, religious brothers and sisters, and the holy priesthood! indeed, there is a crisis in vocations today. "A vocation is an occupation to which a person is specially drawn or for which he or she is suited, trained, or qualified. Though now often used in non-religious contexts, the meanings of the term originated in Christianity. 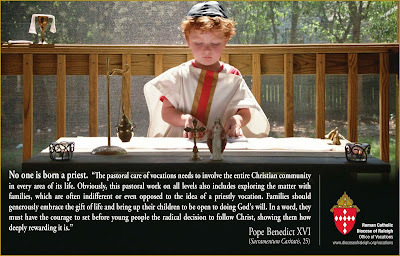 Use of the word "vocation" before the sixteenth century referred firstly to the "call" by God to the individual, or calling of all humankind to salvation and more specifically to the "vocation to the priesthood", which is still the usual sense in Roman Catholicism. Roman Catholicism recognizes marriage and virginity or celibacy as the two vocations. Martin Luther, followed by John Calvin, placed a particular emphasis on vocations, or divine callings, as potentially including most secular occupations, though this idea was by no means new." it seems that regardless of the particular path, all paths, all vocations must be hopelessly devoted to God in Our Lord Jesus Christ! and this journey must be walked with an undivided heart, until the very end. of course, one is never qualified to follow God. rather, God qualifies those whom He calls. again, à la CCC #1, our vocation is to know and love God. how do we do that, you ask? that's where the Church comes in. that's where your parish comes in! that's where your brothers and sisters, our family, help in the discernment process! we cannot do it by ourselves! i need you to be holy. i am relieved to know that we are all praying for vocations! indeed, i cannot do this, one cannot do it all by themselves. however, the Archdiocese of Ottawa is now in the process of tweaking the Vocations Committee format to help foster vocations to the diocesan priesthood. Fr. Tim McCauley, who was the Director of Vocations for the diocese for a number of years, is now taking a much needed break. Temporarily, until things get more official, Fr. Hezuk Shroff, associate pastor of Holy Reedemer, will lead our new team. i will also help, as his side kick! i look forward to this new assignment!!! i will be meeting Fr. Zuk shortly to discuss ideas, looking at the Quo Vadis model, where we gather monthly with men discerning the call to the priesthood, and ? and what? that's where you come in! we are eager to begin, and i welcome all comments, suggestions, critiques, and concerns - either by phone, email, blog, twitter, etc. keep us posted. "the conference itself will begin full steam on Tuesday. Fr. Tim Birney, vocation director from the Archdiocese of Detroit, will be our keynote speaker. In the morning he will speak about “Evangelizing the Faithful: Practical Points for Communicating the Joy of the Priesthood” and in the afternoon “Evangelizing the Clergy: Developing A Pastoral Plan for Vocations." i look forward in working a bit more officially with vocations. however, just like a new ball cap, things don't quite fit yet. i have to work it in. pray for us next week! Heavenly Father, bless Your Church with an abundance of holy and zealous priests, deacons, brothers and sisters. Give those You have called to the married state and those You have chosen to live as single persons in the world the special graces that their lives require. Form us all in the likeness of Your Son so that in Him, with Him and through Him we may love You more deeply and serve You more faithfully, always and everywhere. With Mary we ask this through Christ our Lord. Amen. ps. the videos, Olivia Newton-John live from Amsterdam, Fishers of Men (Trailer, Part One + Part Two = 20 minutes), and Fr. Robert Barron on being a priest today!